As you are aware, Writers’ Forum, Kuwait is a literary organization which provides an equal platform to the Poets and Writers of all the Indian languages without any prejudice of the gender, caste, creed and religious background. 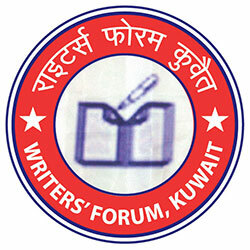 Writers Forum, Kuwait is registered with the Embassy of India under registration no. INDEMB/KWT/ASSN/140. Primarily the Writers Forum, Kuwait is an Indian, a non-political, non-religious, non-governmental, non-profit literary organization in Kuwait. Since its inception on November 03, 1995, Writers' Forum, Kuwait has organized several Multilingual Kavi Sammelan and Mushaira which included many renowned Poets from various Indian languages, Published Navratna in nine languages with English translations, felicitated writers and poets for their works etc. During this journey of the Writers Forum, Kuwait so far, many of the members have published their works / compositions. Writers Forum, Kuwait conducts monthly meetings on the 3rd Friday of each month during which literary works composed by the members are discussed. In order to reach out to the Indian literary person who are capable of writing poems, essays, articles, short stories on any topic /subject in any Indian Language, we invite such individuals to contact following office bearers for further details. We look forward to your positive and prompt response.